Mulaka ellu pachadi is a sweet, spicy and tangy side dish. 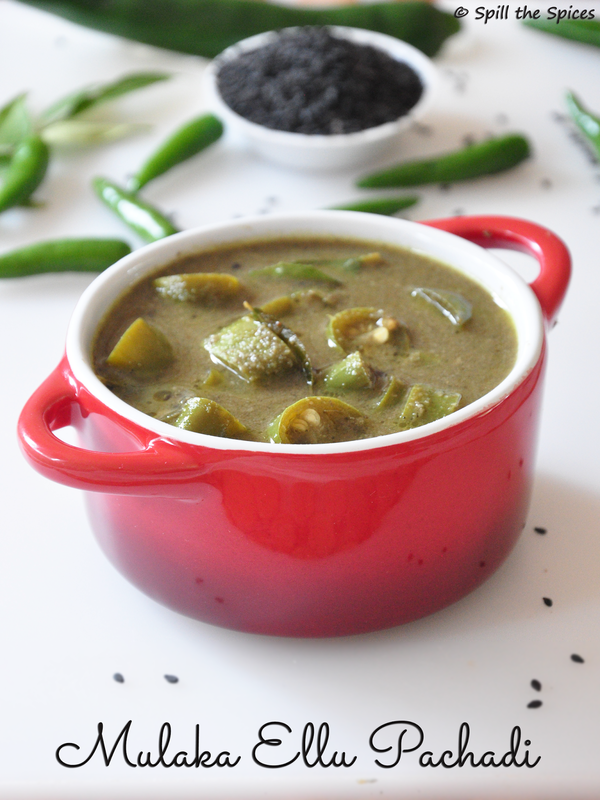 Hot green chillies are simmered in a tamarind gravy and green chilly-sesame-coconut masala. The heat from the chillies is balanced with jaggery. The hot chillies combined with the sweetness from jaggery, tangy tamarind and the nuttiness from sesame seeds brings out a burst of flavors in the pachadi. 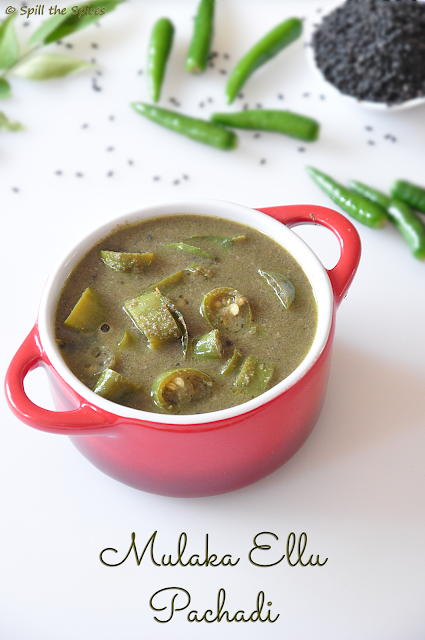 I don't know the origin of this dish, but this is something I ask amma to make frequently. The chillies I get here are not so hot. 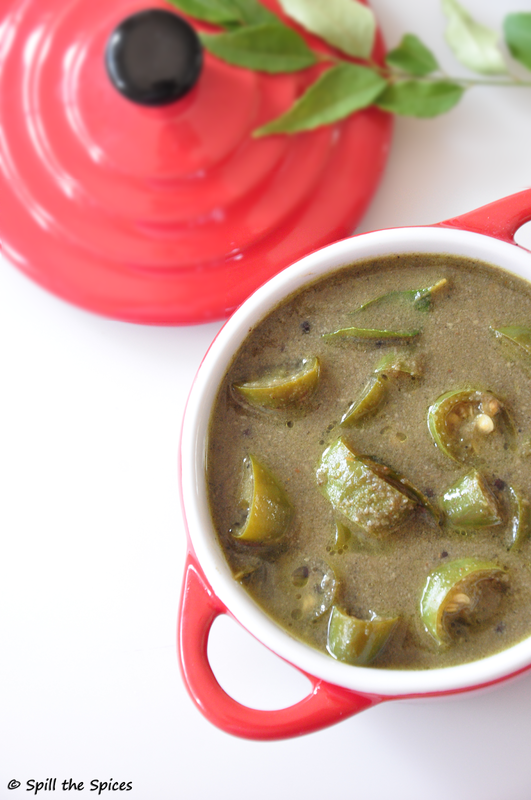 So when I saw these hot Indian chillies in the market, I grabbed them exclusively to make this pachadi. You can have this pachadi along with rice and poriyal/thoran, or you can serve this as a side dish to molagootal, dal or any mildly spiced South Indian gravy. 1. Dry roast the sesame seeds till it starts popping, say 2 minutes. Then grind it with coconut and green chillies to a smooth paste. 2. Soak tamarind in 1/2 cup hot water and extract the pulp. Set aside. Cut the green chillies into 1/2 inch length pieces. 3. Heat gingelly oil and add mustard seeds. When it pops, add curry leaves and green chillies. Fry for 2- minutes. 4. Add tamarind water, jaggery, turmeric powder, salt and mix well. Bring to a boil and cook till raw smell of tamarind goes. 5. Now add the ground paste and little water to make a medium gravy consistency. Boil this 3-4 minutes. Garnish with curry leaves. 1. My green chillies were medium hot, so I added only 1/2 tsp jaggery. If your chillies are more hot, add 1 tsp of jaggery. 2. Adjust the amount of chillies for grinding and frying according to the heat level of chillies. 3. You can also use white sesame seeds instead of black. The color of the pachadi will be lighter in that case. 4. Once sesame seeds start popping, remove from heat. Otherwise it will turn bitter. never heard about this pachadi.. seems to be very interesting.. thanks for sharing sona.. Though new .. Looks delicious.. :) Wanna try some time..
Ahh like u said it will go perfectly with the milder dal curry.I love such spicy curries. wow...that should be hot and tangy right? nice bowl n yummy luking pickle really..
Lovely flavors and delicious hot pachadi. Good clicks. Interesting recipe, looks delicious. Unique and delicious looking pachadi, sounds so yummy. Yeah...one of my favorite, We prepare it a little thicker and call it as pickle!! wow love these connections!! Hot and super nutty pachadi.. This is new to me.. Looks super spicy.. Nicely presented. We make this too but entirely different recipe :) Sounds flavorful with sesame! aah.this is soo new to me..interesting !